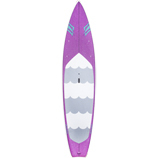 Our Closeout paddlebards are categorized by size. Weather you are looking for that great all arounder to share, that first race board or anything in between, be sure to take a look out our extensive inventory of on sale product. This is the perfect do it all SUP for anyone up to 195 pounds.